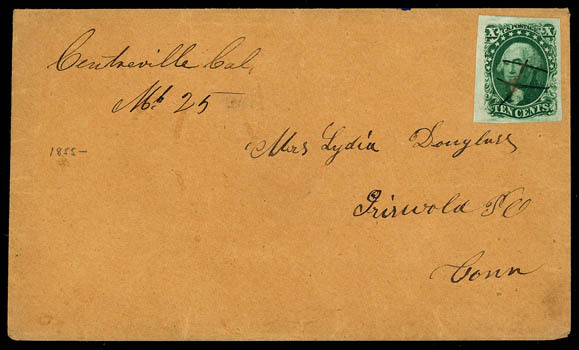 Camptonville, Cal., May 26, 1863 (Yuba), two strikes of cds (YUB-280) on cover to Leeds, England, franked with manuscript canceled 1861, 10¢ yellow green, three singles overpaying the 29¢ rate, with townmark tying one stamp, light red "New York, Am. 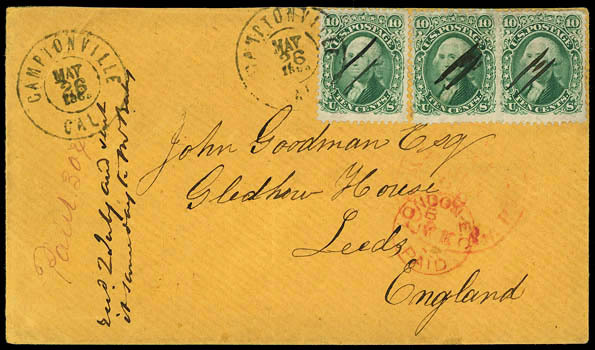 Pkt., 20, Jun 3" exchange cds and London entry; right stamp with minor margin flaws at top, still Very Fine. Scott No. 68 Estimate $200 - 300. Sent overland and then carried on the first trip of North German Lloyd line steamer "America". 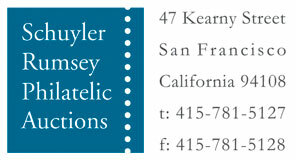 Centreville, Cal., Mr 25. 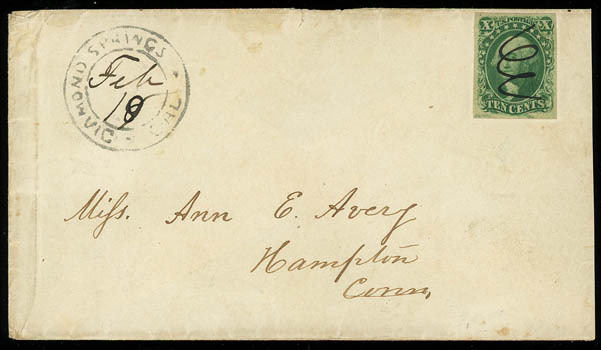 (Alameda), manuscript cancel (Williams ALA-1230) on fresh buff cover franked with manuscript canceled 1851, 10¢ green, type II (large margins), to Iriswold, Ct., Extremely Fine and attractive. Scott No. 32 Estimate $300 - 400. Diamond Springs, Cal. (El Dorado), double-circle postmark (Williams ELD-720) with manuscript "Feb 19" date at center on cover bearing 10¢ green, type II (14), four full to large margins, cancelled by matching manuscript squiggle, to Hampton Conn.; some edge wear, Very Fine and scarce use. 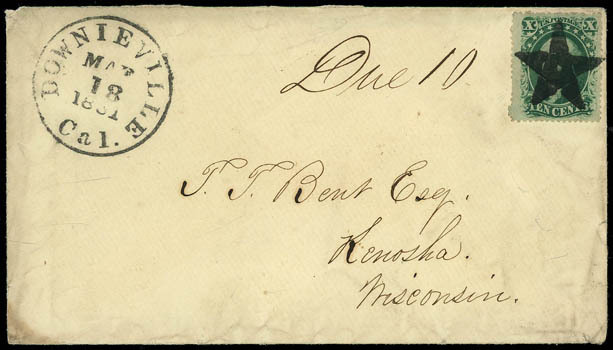 Downieville, Cal., May 18, 1861 (Sierra), cds on cover to Kenosha, Wis., franked with 1859, 10¢ green, type V tied by bold socked-on-the-nose strike of fancy Star handstamp, manuscript "Due 10" alongside; couple tiny stamp flaws and partial backflap, otherwise Very Fine; with 2016 P.F. certificate. 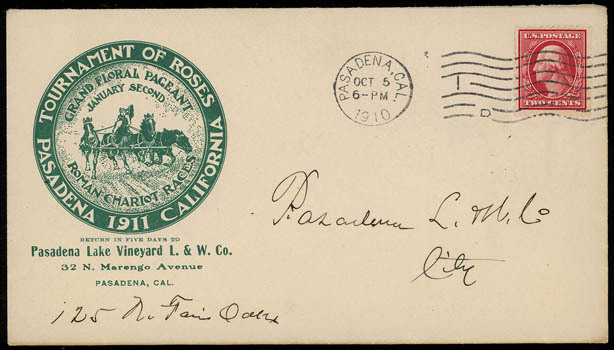 (Pasadena) 1911 Tournament of Roses, 3 1910 covers each with a different colored ornate advertising (green, blue, purple), fresh & Very Fine, Beautiful. Roberts Landing, Cal. 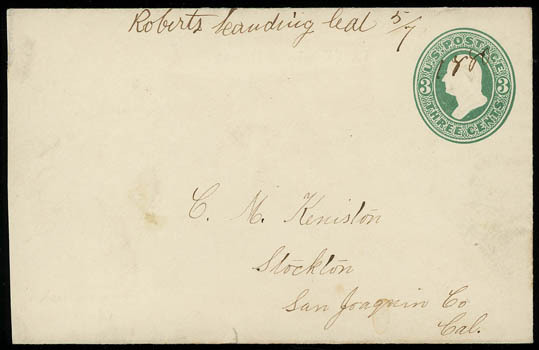 5/7 (San Joaquin), manuscript postmark (SAJ-2200) on 3¢ green entire to Stockton, with "1880" year date postmark canceling indicia; reduced at left, Very Fine, scarce with postmarks known only during a year and a half period.